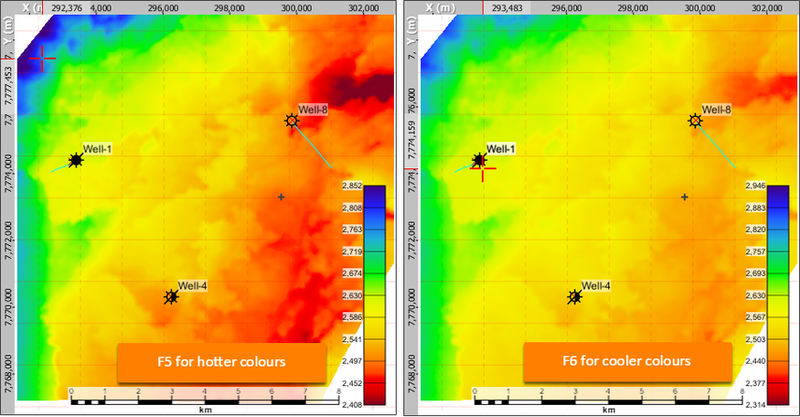 In map and section views, use the F5, F6 and F7 keys to quickly change the look of the data. The map view can display both horizons and slices from volumes. Horizons take priority when using the hotkeys. In Map View, select the desired horizon or volume slice. Press F7 or Shift F7 to cycle through the default colourbars. Press F5 or F6 to adjust the colour range to be “hotter” or “cooler”.